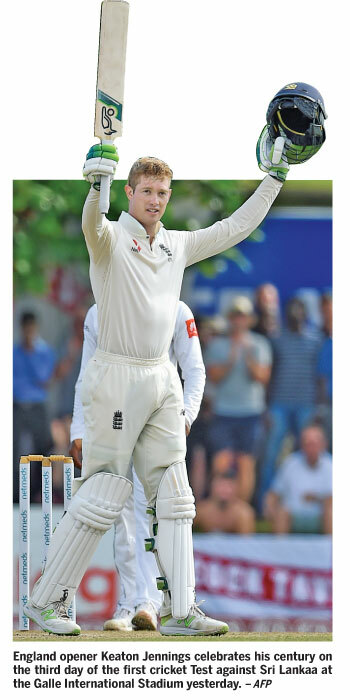 GALLE, Thursday: England propelled by opener Keaton Jennings’ second Test hundred put themselves firmly in the driving seat to win the first cricket Test after setting Sri Lanka the overwhelming task of chasing down 462 runs for victory over the next two days at the Galle International Stadium yesterday. 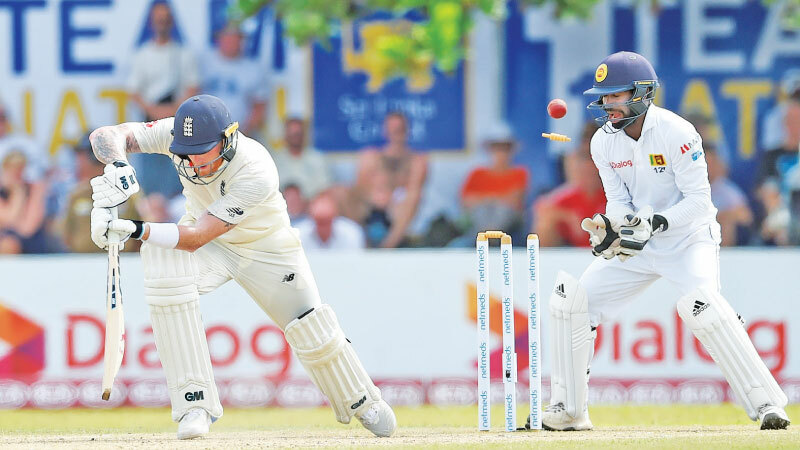 Jennings played a real patient and disciplined knock of 146 not out off 280 balls (9 fours) as England with a first innings lead of 139 closed their second innings at 322-6, leaving Sri Lanka with the task of seeing through seven overs of pace and spin. Openers Dimuth Karunaratne (7) and Kaushal Silva (8) negotiated them safely without any alarms to see the day off at 15 without loss. Weather permitting Sri Lanka have a tough task ahead of them to stave off defeat having to survive 180 overs over the next two days and a target as large as 447 runs still looming ahead of them. They are also handicapped to a certain extent by the groin strain to captain Dinesh Chandimal who did not field for the entire duration of the England second innings and will be able to bat only after the fall of the fifth wicket at no. 7. The English batsmen gave a display of batting yesterday which the Lankan batters should take a leaf out of and try and emulate if they are to get out of jail and save this Test match which incidentally is spin legend Rangana Herath’s last. It would be a crying shame if Herath is sent home with a defeat in his farewell Test after all that he has done for the country by bowling them to an innumerable number of victories with his left-arm spin. Jennings who is one of two openers trying to fill the spot left vacant by Alastair Cook set the tone for England for the rest of the day with a batting display that has placed his team in a winning position. He anchored the innings and built up useful partnerships of 60, 107, 77 and 61 with co-opener Rory Burns (23), Ben Stokes (62), Jos Buttler (35) and Ben Foakes (37) respectively to put England firmly in control. 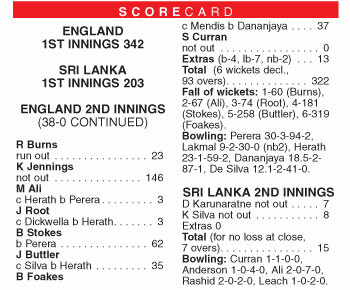 Any chance Sri Lanka had of running through the England batting line-up in the second innings was thwarted by Jennings’ workmanlike innings. With the pitch not offering the usual assistance that Galle surfaces normally do, the Lankan spinners were made to work hard for their wickets. They managed to grab three before lunch but took only a further three in the next two sessions. The five wickets that fell to bowlers were all captured by spinners Dilruwan Perera, Herath and Akila Dananjaya. Burns the other batsman vying for the openers spot was run out off a suicidal run. He hit the ball straight to mid-on and took off for a run and failed to beat Karunaratne’s direct throw at the non-striker’s end. One wonders whether Burns mistook Karunaratne for Herath because the veteran cricketer was fielding in that position earlier and the England batsmen were taking liberties with him by stealing runs capitalising on his slowness on the field. The pitch played so well that none of the England batsmen offered a chance. The only one that Sri Lanka missed was failing to review an lbw appeal against Jennings when he was on 58 off Dhananjaya de Silva which they thought the batsman might have got an inside edge onto his pad. Had they called for the review they would have ended Jennings’ innings early as TV replays showed the ball missing the bat and hitting middle and leg stumps. Sri Lanka’s highest successful run chase is 388 against Zimbabwe at the R Premadasa Stadium in 2017 and the highest fourth innings total they have achieved in a run chase is 410 against Australia at Hobart in 2007 after being set 507 to win. So getting to the target set by England will be an overwhelming task but not impossible. The highest successful run chase at Galle is 99-3 by Sri Lanka against Pakistan in 2014 but it is of little consequence here.